Orkney Image Library - Mystery person from Orphir? Another photograph from Mum's (Rhoda Spence, nee Groundwater) archive. This one is a bit of a mystery. I have a name but who is he? I assume that this was taken during WW1 so the date would be about 1915. My Groundwaters originated from Orphir, Scorriedale. This gentleman's cap badge appears to be that of the WW1 Royal Naval Air Service (now known as the Fleet Air Arm). I believe that badge was issued to those with the rank of Petty Officer, but I may be wrong. Thank you to Edmund for that information. It gives me something to go on. Isobel, my great-grandfather was James F. Groundwater; he was born at Scorriedale. Royal Naval Air Service Chief Petty Officer's red thread cap badge now very rare. One on Ebay selling for £165. There was a Thomas Groundwater born at Oar in Walls 10.10.1887 which, if it were him, would make the Serviceman in the photograph about 28 years old. Son of William Groundwater and Ann Ward, his gt grandfather, Alexander Groundwater was born in Orphir, 19.5.1776. Thank you for that Nicol. I have two Alexanders in my family but born much later. Also a Thomas, born Thomas Groundwater, my Great-great-uncle, born June 20 1863, Orphir. He died on Sep 10 1882 in Kirkwall. He has a sister, Tomima. You might be correct in thinking that his name begins with a 'T'. James is a common name for a Groundwater and there is also a Tomima. She married William Slater. My Great-great uncle was Thomas but he died in 1882. 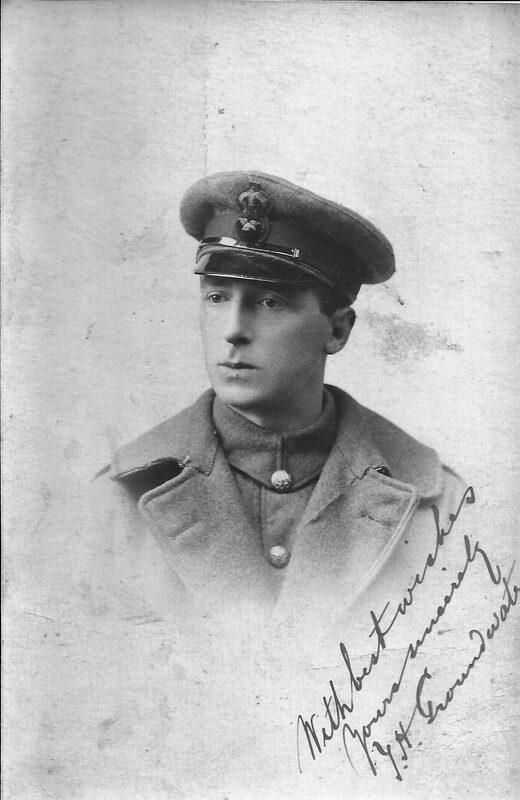 Thomas Groundwater, son of William Groudwater, was in the RNVR. His service record is on FindMyPast but his rank is Ordinary Seaman, then Able Seaman. No middle initial. Wondering how James Thomas Groundwater is linked to Scorridale. He's not a name I know. From a very brief look, I'm more inclined to say Suey maybe? ?